Well equipped apartment with a newly installed kitchen (see photos) and bathrooms. The apartment has also been recently decorated. The apartment is equipped with fibre optic wifi ,a flat screen television, dvd player and English digital free-view. The kitchen comes fully equipped with all the usual appliances including: kettle, toaster, rice cooker, microwave, crockery, cutlery, glassware and pots and pans, fridge/freezer ,coffee machine,etc. This year has seen the bedroom refurbished with new twin beds which can be made up as a large double should you wish,New luxury bed-linen by Zara home, The White Company and Cologne and Cotton of London,the beds have mattress protectors and enhancers on for your extra comfort, so have the pillows which are down and feather. The bedroom has also had a change of furniture to add to your grater comfort giving you a large dressing table with draws under and a long mirror above so that two people can use it simultaneously.New lamps have been added and lighting above to make more user friendly. The curtains have also been changed this year ,giving you interlined cotton Toil d jouiey french fabric for that touch of luxury,also to help block the sun out. Last season a new double sofa bed was added ,giving comfort.to those that sleep on it. The apartment is located in the Carolina park complex which has lush gardens, two swimming pools and a paddling pool, tennis court, parking and is situated on the famous Golden Mile, one of the best address in town. There are numerous restaurants and cafe bars around the complex,which serve food.The flat is equipped with fibre optic WiFi .You never need to move far to enjoy the delights of Mediterranean food,or for that matter Asian and oriental,every taste is provided for with a few minutes from the apartment. Well equipped apartment great location. Hi ,this apartment has been my holiday home for a very long time ,it's been loved by my two children who both learnt to speak Spanish in the local pool bar and went on to take it at GCSE,s. The location is fantastic as it's just across the the beach and near to town ,you don't need a car.i am still enjoying going after all these years .and hope to do so for the forseable future. you will need to supply your own washing power,but anti cal is provided for you please use this as not only does it help clean your clothes but preserves the life of the machine. all towels are Egyptian or Turkish. The living space is light and airy with a feeling of space, there are 2 sofas one only a year old, both are beds, numerous lamps,flat screen tv. and book cases with books for you to read. and grill,this is there for your convienance ,as it takes less time to heat the grill than the oven . yes, but we do not supply the coffee or the filters, there is also a cafetiere for your convince. yes with a pop up rack to warm croissants. The kitchen is equipped with everything you need in a home from home .oven ,hob, extractor ,toaster, kettle , coffee purculator ,bottle openers, electric can opener ,plates ,knives and forks, cups . yes, we have plenty of books, from travel to novels. the complex has beautiful well maintained gardens for your pleasure. a long balcony that runs the length of the apartment with sea and mountain views. a great place for breakfast. yes there is a tennis court that you may use. a great place in to spend a few weeks in the sunshine with everything on your doorstop. Beautiful apartment equipped with everything you could need, set in lovely secure grounds. Beautiful apartment, fantastic location, nearby restaurants and shops, a stones throw away from the beach. Excellent value for money, will definitely be booking to stay here again. The apartment is beautifully and very conveniently located. It is a gated and well-kept community, close to the beach, parks and shops. The apartment itself is fully equipped, much better than many rental ones with a lot of dishes, utensils, towels, etc. We were not very lucky with the weather, despite seasonal statistics it was not sunny, but cool and breezy, still there are a lot of things to do in Marbella besides sunbathing. We strolled along the beach (a very convenient promenade), explored the historical town, went to Puerto Banus, etc. The owner (Mrs Diane) and the caretaker are very much friendly and helpful with many things (paperwork needed for our bank transfer, meeting us after hours (late flight), etc.). It is really a pleasure to deal with such people and to have holiday in Marbella! If the schedule permits, we shall return next year! This is a lovely apartment, very clean, comfortable and well equipped. It is very close to the beach and prom walk of the "golden mile". It is not exactly in the centre of Marbella, but if you are feeling energetic enough, the old town of Marbella is only about 20-30 mins walk away and if, like us, you are a little lazy some days, there is an excellent bus route around the corner. The apartment is very well situated for the supermarket, pharmacy and bakery and there are also some excellent restaurants very near. The apartment is situated in a complex that has lovely pools and gardens which would suit couples with children. We were met by Ken and Pam on behalf of Diane, the owner of the apartment, and they were most helpful. My husband and l would certainly recommend this apartment to family and friends and we would definitely love to stay here again. Thanks to Diane for sharing her lovely apartment with us, it was like a home from home! A beautifully decorated apartment in a really good location. I love the fact that it had two bathrooms and was very spacious for a one bed apartment. It was so central and we didn't need a car - so close to beach, restaurants and supermarket. I would definitely come back again. This is a fantastic apartment with excellent facilities. Secure, great swimming pool. Ideal for couples or families. Can't wait to go back. Stayed for just over a week. The apartment is in a fantastic location, just a few minutes walk to the beach. There were several restaurants within walking distance, one literally next door to the complex, at which we had 2 fabulous meals. There were 2 supermarkets and a petrol station a couple of minutes walk from the apartment, which was very handy. The complex had 2 pools and a tennis court (although we didn't try this out). The decor was beautiful, very stylish and calming, with lovely bed linen and curtains etc. The beds were very comfortable and main bedroom had a beautiful ensuite bathroom. The balcony was very private and perfect for drinks. The apartment was very clean and very well equipped with all the usual mod cons needed for a holiday, including a washine machine and dishwasher. We will definitely go back there next year! Located on the the 'Golden Mile' between Marbella and Puerto Banus, 9 minutes to the centre of Marbella. 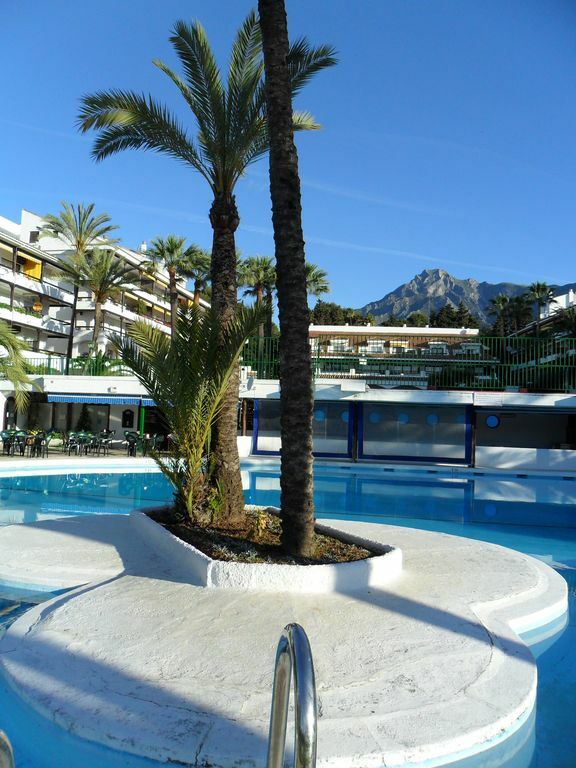 It is only 5mins walk from the costa del sol beaches. Only 2mins from the famous Marbella club and the Puente Romano hotels. Golf: These are the five closest golf courses to the apartment. There are many many more in the region. Ski: Sierra Nevada Mountain range, close to Grenada. For longer periods discounts can be given please email your request to the stated email address.also email with any request you have and we will see if we can fit it with your requirements. 10% discount for returning clients.